In today’s world, analytical thinking is a critical part of any solid education. An important segment of this kind of reasoning—one that cuts across many disciplines—is discrete mathematics. Discrete math concerns counting, probability, (sophisticated forms of) addition, and limit processes over discrete sets. Combinatorics, graph theory, the idea of function, recurrence relations, permutations, and set theory are all part of discrete math. Sequences and series are among the most important applications of these ideas. 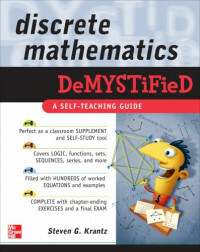 Discrete mathematics is an essential part of the foundations of (theoretical) computer science, statistics, probability theory, and algebra. The ideas come up repeatedly in different parts of calculus. Many would argue that discrete math is the most important component of all modern mathematical thought. Most basic math courses (at the freshman and sophomore level) are oriented toward problem-solving. Students can rely heavily on the provided examples as a crutch to learn the basic techniques and pass the exams. Discrete mathematics is, by contrast, rather theoretical. It involves proofs and ideas and abstraction. Freshman and sophomores in college these days have little experience with theory or with abstract thinking. They simply are not intellectually prepared for such material.